We're using our Facebook page to keep you up to date with the club activities. Central Model Helicopter Club member Gary Townsend was presented with his BMFA A-Certificate by one of the country's top pilots, Steve Roberts who is a member of the British F3C Aerobatic team who visited our club over the Easter weekend to fly the 'Aerobatic Helicopter Association' season opener. Gary spends hours on the simulator and on the field and is expected to be entered for his B-Certificate in the next few months. There are some more pictures on the AHA Season Opener page. The latest flyer to gain an A-Certificate is Neale Bassford. Neale is not new to the hobby, although he has only been flying model helicopters for two or three years he is one of the most advanced pilots in the club. His real goal is the B-Certificate, but you can't get that until you've got the A-Certificate under your belt. 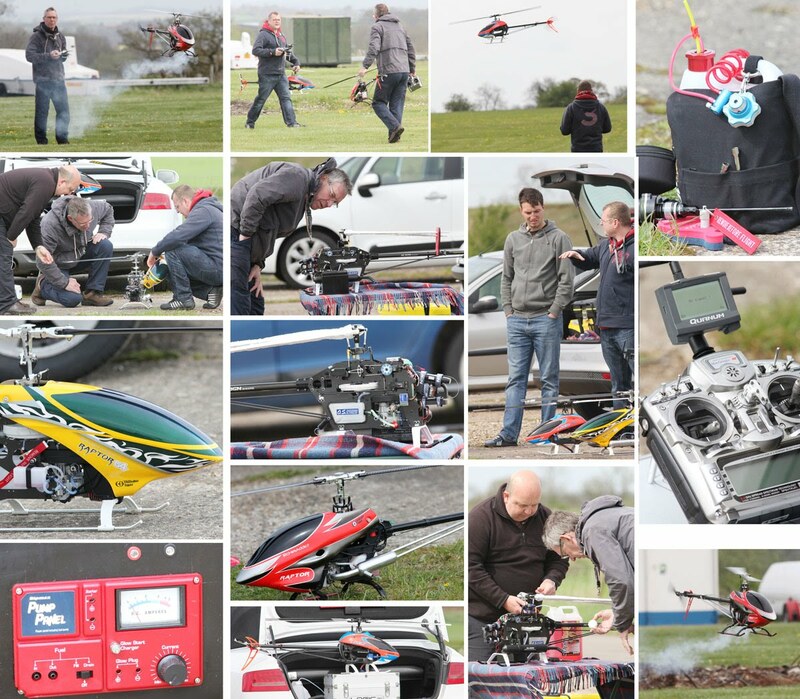 He said, "it's an opportunity to thoroughly brush up on on your safety procedures which must always be the most important aspect of the hobby, as well as keeping up with some the latest rules and regulations which govern model flying." The certificate proves he can maintain and safely set up a model helicopter as well as perform some well practiced manoeuvres including forward and reverse flying. The test includes testing his ability to safely fly a large figure of eight on the flying field. Part of the test is intensive questioning about safety procedures, flying while keeping within the rules as laid down by the British Model Flying Association, the BMFA. Mark Baxter has been flying model helicopters for two or three years now and has got to the stage where he has proved his ability to fly safely. Other experienced colleagues have guided him as well to this stage. Next stage is the B- Certificate, for advanced flyers and those wishing to be able to take part in public flying events. 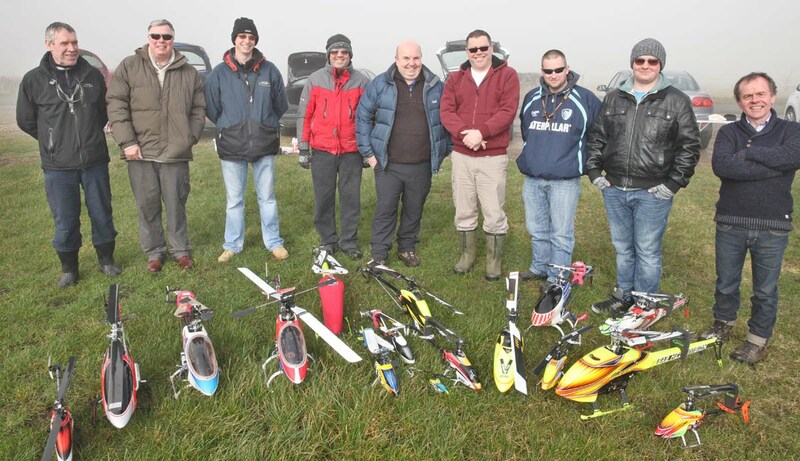 The Central Model Helicopter Club was formed in January 2014. The CMHC aims to promote and develop model helicopter flying in central England. A group of helicopter flyers decided to take their knowledge base and resources to a full size venue to enable them to work collaborately with their full size counterparts. Now the club is one year old and we are in a position to take on a few new members. It doesn't matter if you are new to the hobby and just enthusiastic because help is always available to get you up in the air for the first time. It's not easy and just a tiny bit of progress can make your day and put you in a good mood for the rest of the week. Most members can help a flyer get off the ground, but we have three BMFA approved instructors and examiners who can give a hand with more advanced help. We are affiliated to the British Model Flying Association and all members must carry the BMFA membership card which includes the necessary insurance to allow us to fly. We are based at The Gliding Centre, Husbands Bosworth in Leicestershire. The Gliding Club put on a special bonfire night event. Alongside the usual raging bonfire and fireworks the crowds saw 18-year-old Alex Hawtin, a friend of our model heli club, give a demonstration of night flying. 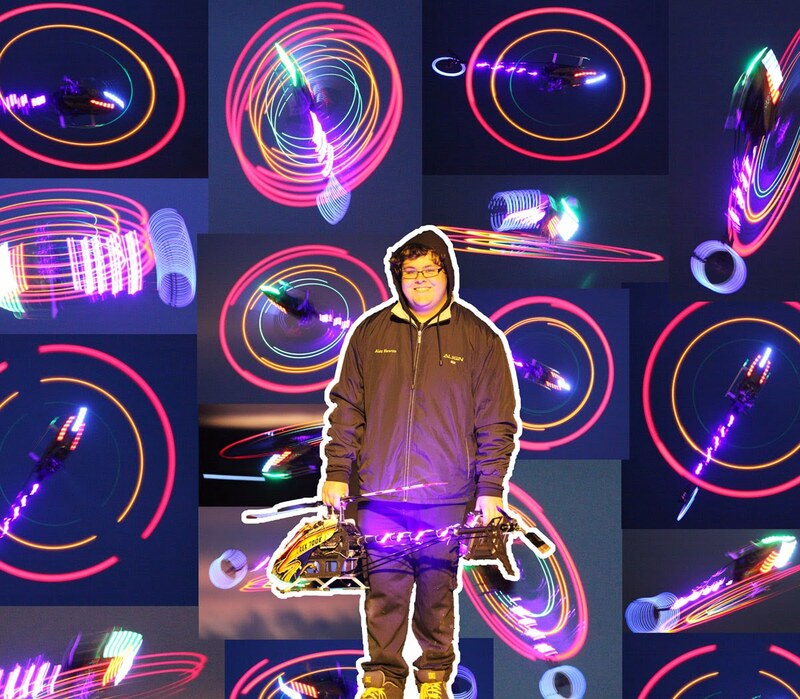 It was a fast 3-D display with his model helicopter rigged with multicoloured lights. He was piloting a 700 size very powerful electric helicopter as used by many of the worlds professional pilots. Alex finished fourth in the British 3D Championships where contestants are expected to fly extremely fast free style, upside down, using various patterns in the sky. The illustration shows Alex pictured on the night and we've placed many of the pictures we took of his display around him. We can fly everyday of the year but Saturday mornings are the most popular with pilots turning up often just after sunrise and if it's cold or rainy there is always the Glider Cafe which serves a full English breakfast. We fly at The Gliding Centre just outside Husbands Bosworth which is near Market Harborough, south of Leicester. Because we share the site with full-size powered aircraft and gliders we operate from four areas within the field to take wind direction into account. After you enter the Gliding Centre about 100 yards up the road there is a windsock. This is A. A bit farther round near the remains of the bonfire is B. The main car park and the offices are near area C.
Right at the other end of the main runway is D.